The No. 17 Quinnipiac Bobcats return to the ice this weekend with their final non conference games of the season when they welcome the Arizona State Sun Devils to the cold confines of the northeast. The Bobcats were off last weekend as other ECAC teams were in action. Quinnipiac comes into the weekend in fourth place in the ECAC and its possible when the weekend ends they may be in sixth place in the conference depending on how Cornell and Clarkson fare on the weekend as these are the two teams directly behind the Bobcats. This weekend against the Sun Devils will not do anything for Quinnipiac in the pairwise if they win. If they lose that is another story as it will be beyond damaging to their NCAA's at-large chances. I personally would like to see them play better teams than Arizona State but I can see why coach Pecknold does this. He is showing the same courtesy that good teams showed when Quinnipiac was building their program back in the late 1990's and early 2000's. Arizona State won't forget this when they become good should they want to schedule Quinnipiac again in the future. Head coach Greg Powers has done a solid job in year two for the Sun Devils. On the season Arizona State is 9-17-2. They have seven division wins this season including big wins over Air Force and on the road at the University of New Hampshire. They also had an impressive 2-2 tie against Ohio State a team ranked 8th in the pairwise rankings. This is a program that has played a difficult schedule this season with games against Notre Dame, Air Force, Northeastern, Harvard, Michigan, New Hampshire, Boston College, Penn State, St. Cloud State, Denver and Ohio State. They have been competitive in a lot of these games even if the results have not been fully there yet. 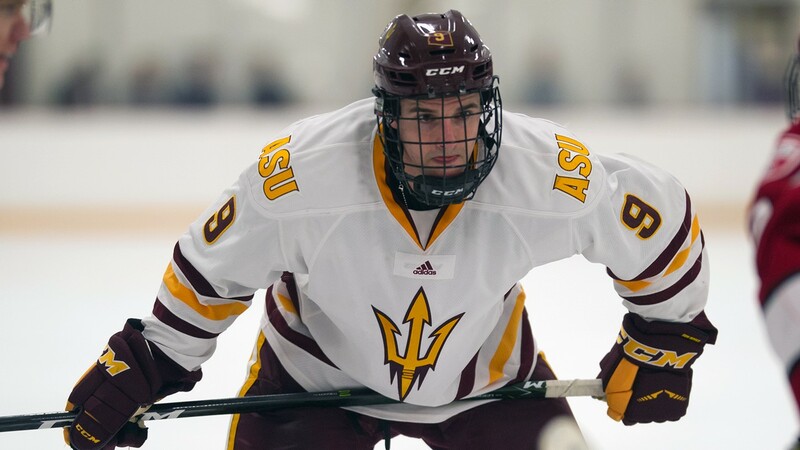 A season ago Quinnipiac defeated Arizona State 5-0 in October 2015 in the first ever meeting between the programs which was the Sun Devils third ever Division I games. Thomas Aldworth had two goals and an assist in that game and the Bobcats out shot them 57-14. The rest of the goal scorers in that game for the Bobcats have either graduated or departed early for the pros. On offense Arizona State has shown solid improvement from a season ago. They average 2.89 goals per game which is 33rd in the country so right in the middle of the pack. Quinnipiac is just a shade better at 2,92 goals per games good for a tie for 30th in the country. They have some size up front that possibly could give the Bobcats some problems. The Sun Devils top scorer is senior Robbie Baillargeon (2012 5th round, Ottawa) has 20 points (9 goals and 11 assists). Baillargeon an Enfield, CT native played his first three college seasons with Boston University before transferring out to the desert. 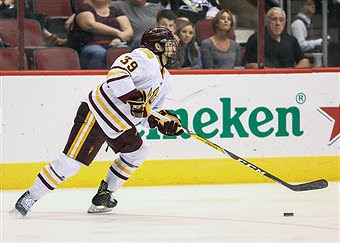 Junior Wade Murphy (2013 7th round, Nashville) who transferred from North Dakota has 16 points (7 goals and 9 assists) while they are getting really nice production from three underclassmen. Freshman Tyler Busch has 16 points (7 goals and 9 assists) while sophomores Louie Rowe and Anthony Croston have 14 and 13 points respectively. As a team they are averaging 24.6 shots per game. The Sun Devils on the power play are not very good scoring only on 13.60% of their chances (17 of 125) good for 51st in the country. The Bobcats are solid on the penalty kill at 84.3% (107 of 127) which ranks 25th in the country but down from where they were a season ago. If Quinnipiac can play vintage Bobcat hockey on defense where they block shots and keep opponents to the side boards they should be able to take the Sun Devils out of their game. On defense the Sun Devils are not as bad as some of the numbers show. While they give up 4.18 goals per game which ranks them 58th they have faced seven of the top sixteen offenses in the country this season. Quinnipiac is not one of those teams and has had trouble at times scoring goals this season. The Sun Devils best defender this year has been freshman Brinson Pasichnuk. He is the teams top scorer from the blue line with 12 points (6 goals and 6 assists) but also has three power play goals and two game winning goals. What is even more impressive is his willingness to do the little things like blocking shots and he leads the Sun Devils with an astounding 50 blocks this season. That is 18 more than sophomore Jakob Stridsberg who has also been solid this season as well with 11 points (6 goals and 5 assists). Arizona State is one of the more heavily penalized teams at 16.43 minutes per game so Quinnipiac should be able to exploit the Sun Devils on the power play even though they convert on only 17.79% of their opportunities (29 of 163). The Sun Devils are not very good on the penalty kill as they have only killed off 75.9% of opposing teams power plays which is good for 54th in the country. The Bobcats have to play aggressive and have to be able to have a strong fore-check in this game to create mistakes from the Sun Devils. Arizona State has yet to find consistent goal-tending this year as they have played all three goaltenders on the roster this season. They have senior Robert Levin, sophomore Ryland Pashovitz and freshman Joey Daccord. All have struggled at times this year and none of them have been able to get into a good rhythm. It really remains to be seen who Greg Powers will start on Friday. It wouldn't shock me if all three goaltenders saw action this weekend for the Sun Devils depending on how the weekend plays out. This is really an important weekend for the Bobcats as they need to start building confidence down the stretch. They can not afford to have many slip ups down the stretch and a slip up against a team like this would be devastating and destroy any at-large chances which are already dwindling away. Quinnipiac is a more experienced team compared to Arizona State which has 19 of 27 players who are underclassmen. If Quinnipiac can play to the teams strengths and find their identity then they should have no problem sweeping this team. If they don't give a quality effort and don't play to their identity then the Sun Devils will give them problems.